Moving can be a big hassle, especially if you are looking for reliable yet cheap removals in Heywood. Apart from packing up all your belongings and dealing with the stress of moving itself, finding a company that does the removal is an efficient and professional manner, is a plus point. This is one reason why Littleborough Removals stands apart from the rest. Apart from being highly professional and efficient, Littleborough Removals’ rates are affordable and always within the range of the estimate that is provided. In Heywood, cheap removals are the main enquiry at Littleborough Removals, particularly about how to pack glassware. These professional removers recommend that each glass and cup should be individually wrapped with bubble wrap and then taped, so it does not open during transit. If you cannot access bubble wrap, then newsprint is fine too. If you are going to pack the glass with other items, be sure to place the glass pieces on top. Try to use dish-packing boxes that have square-shaped cardboard dividers for the glassware. Place an item that will act as a cushion in the bottom of the square along with a layer of crumpled newspapers and packing peanuts. Then place each divider into the box and place each individually wrapped glass in the upright position. If there are any gaps, make sure you fill them with additional packing material. If you do not do so, the pieces will move around in the box and possibly break. Place crumpled newspaper and cardboard on top of the packed material. Use tape to seal the box, and using a permanent black marker write “Fragile-Handle With Care-Glassware”, on both sides of the box. 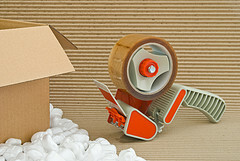 Use packing tape whenever possible as this will likely keep the box sealed during transit. If you require cheap removals in Heywood, then contact the most reliable and professional removal service, Littleborough Removals. They specialise in both domestic and commercial removals, and can help you move to any location within the country. This entry was posted in Removal Company and tagged cheap removals in Heywood, Heywood Cheap Removals. Bookmark the permalink.